Even if Flash Player is not officially supported anymore on Android since version 4.1, that doesn’t mean you can’t install it yourself, as some sites require it. Here’s how to do it. 1. Since it’s unsupported, you won’t be getting it from the Google Play Store. 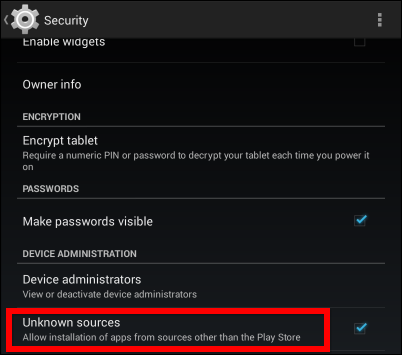 So you need to make sure that your phone or tablet allows the installation of apps from unknown sources. 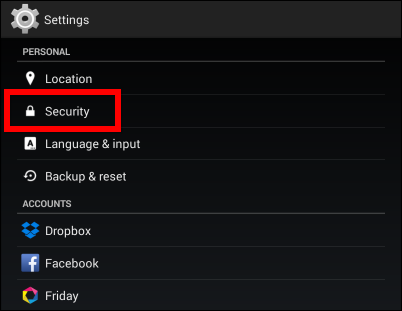 Under Settings, go to Security. You will find it under Personal. 2. Make sure the installation of apps from unknown sources is allowed. If you don’t do so, you won’t be able to install Flash. 3. With that out of the way, the next step is to find a version of Flash to install. You should know beforehand that Flash for Android is no longer supported, so you’re proceeding pretty much at your own risk. 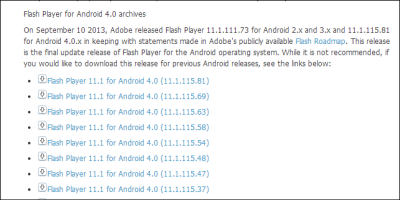 Now that we’ve got that clear, visit this page on the Adobe website and scroll down until you find the latest version of Flash that fits the Android version on your device. 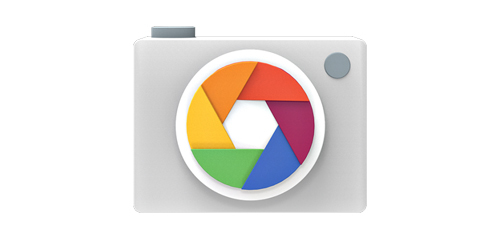 You can download the file on your computer and then copy it to your Android device (or, why not, even email the file). I would say that the easiest way is to just type http://goo.gl/mN3yNs in the address bar of whatever browser you’re using on Android and download the respective version. (I’ve shortened the link for you, as you could see). 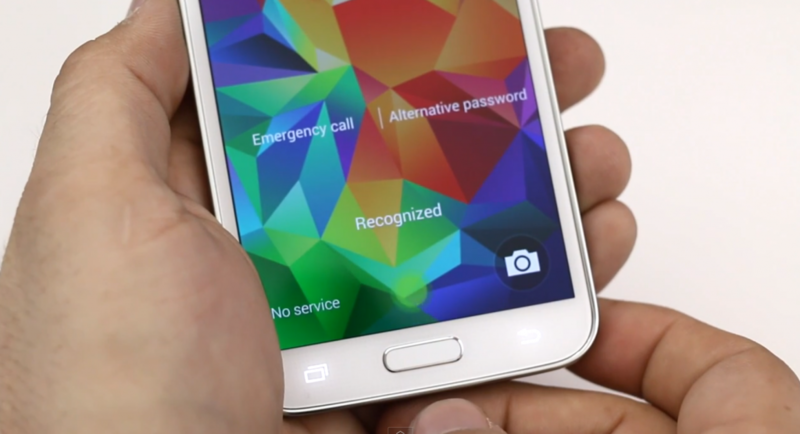 In my case, it was the latest Android 4.0 version. 4. 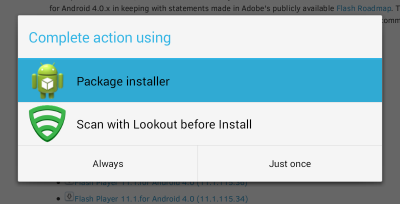 Either way, the moment the file is downloaded or copied to your Android device, use the package installer to start its installation (you can scan it with your antivirus solution, provided you have one and you want to make extra-sure that everything is in order). 5. Then, confirm that you want it installed and wait for the process to end. 6. Once it’s all done, don’t forget to disallow the installation of applications from unknown sources – unless you’re using an alternate app store, like the Amazon one, in which case it has to be left that way. 7. Now that you have the plugin, you’ll need a browser that supports it, like Firefox for Android. Google Chrome is completely out of the question, since Google has cut off all Flash support. Restart your Android device after installing Flash Player and Firefox. Normally, this step shouldn’t be necessary, but I’ve discovered that it only worked after a restart. After all, the dozens of seconds it takes to restart your device shouldn’t be too much of an issue. 8. Browse the web like you normally would and, when Firefox encounters Flash content, you will be asked whether you want to use the plugin. Tap that area and the plugin will become active. 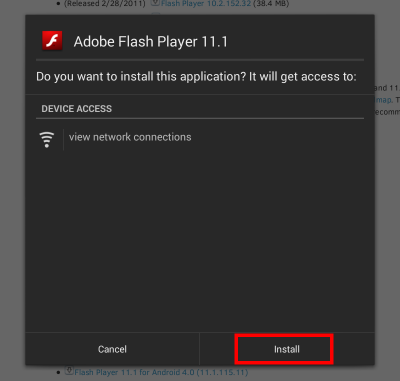 Installing Flash Player for Android isn’t difficult at all, as long as you follow the simple instructions above. The great thing is that it will allow you to enjoy some great content, that you normally wouldn’t get access to.